DESERT HOT SPRINGS, Calif. - Sept. 12, 2017 - PRLog -- Two Bunch Palms gained notoriety for its historic soaking grotto with natural hot mineral springs in the midst of the California desert. Today, the renovated spa and resort is best known for award winning spa treatments, farm to table cuisine, and a commitment to sustainability. This fall, Two Bunch Palms is the site of Yoga Unplugged, a three-night deep training focusing on yoga, meditation and mindfulness led by Honolulu-based yogi Jennifer Reuter and Honolulu certified yogi Monica Ross. Participants of all levels of yoga practice are encouraged to attend the retreat from Thursday, October 19th through Sunday, October 22nd. At the retreat, guests benefit from a style of teaching crafted over years of learning and practice. "Yoga Unplugged was developed from my philosophy of practicing yoga, meditation and mindfulness as a way of life, both on and off the mat," explains yogi Jennifer Reuter. Retreat guests will learn theory and enrichment in the healing space of Two Bunch Palms while participating in meditation and yoga practices daily. Teachings will take place in the Celestial Dome, a 3,000-sq. ft. passive solar earth mound, and on the great lawn, a natural open area steps away from meditation ponds, gardens, and wildlife. Three nights of luxurious accommodations, entry to the world-renowned mineral rich hot springs and organic farm to table meals from the resort's famed Essense restaurant are included. Jennifer Reuter has completed in-depth training in connecting physical, mental, and energetic well-being through yoga, meditation, and tantric studies for nearly two decades. She co-founded of the Yoga Teacher Training School in Honolulu, Hawaii and had the privilege of coaching hundreds of yoga teachers within this belief system, thus giving birth to her brand of practice, Yoga Unplugged. Monica Ross became a certified yoga teacher under Reuters' program in 2008 and taught for several years in Honolulu. In 2014, Monica helped establish the first brick and mortar wellness center for Wanderlust in Hollywood, California, producing hundreds of mindful living focused events that put Wanderlust Hollywood on the map as Los Angeles' premiere wellness center. In reuniting with Jennifer Reuter to co-present Yoga Unplugged, Monica continues to build this community of mindful learners in a setting conducive to releasing stress and renewing well-being. More information and registration is at https://yoga-unplugged-retreat-at-two-bunch-palms-resort.eventbrite.com. There are a limited number of spots available. Individual day pass information for the Yoga Unplugged retreat will be announced at a later date. Jennifer Reuter and Monica Ross have over 25 years of experience combined. Jennifer Reuter (jenniferreuteryoga.com) began her yogic journey in a gym where she was a certified personal trainer and group fitness instructor. She earned her first certification to teach yoga in 2000, and began teaching and practicing yoga full time in 2004. A consummate student, Jennifer spent almost two decades studying a variety of yoga styles, along with Sanskrit, meditation and tantric studies. After years of preparation, Jennifer co-founded the Yoga Teacher Training School in Honolulu, Hawaii, sharing her understanding of ancient and modern principles for future yogis. Monica Ross (monicarossyoga.com) is a certified yoga teacher and lifetime meditator who currently lives in Los Angeles, California. She has spent her career learning the art and science of kinesthetics, and her style of yoga incorporates this knowledge of safe and intelligent body movement. After helping to establish the first brick and mortar wellness center for Wanderlust in Hollywood, California, Monica went on to produce mindful living focused events and workshops that helped to put Wanderlust Hollywood on the map. 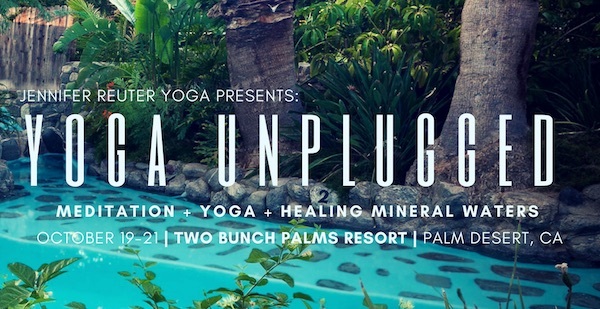 Presented by Jennifer Reuter in conjunction with Monica Ross, Yoga Unplugged (https://yoga-unplugged-retreat-at-two-bunch-palms-resort....) provides theory, enrichment, meditation, and yoga practice daily in the healing space of Two Bunch Palms. This is a limited engagement and only a handful of spots remain. Day passes will be offered soon. Two Bunch Palms (www.twobunchpalms.com) is located at 67-425 Two Bunch Palms Trail, Desert Hot Springs, CA 92240. Two Bunch Palms sits on 77-acres and is home to the famed hot mineral rich springs. The newly renovated spa and resort is recognized for its historic legacy as well as its ecologically friendly design and sustainable practices.